This is a very tasty dish, reminiscent of lasagna. It makes a HUGE amount, so if you have a small family, you could divide it into two dishes and freeze half. 1. Bring 6 quarts of water to boil in a large pot over high heat. 2. Meanwhile, cook sausage in a 12-inch nonstick skillet over medium-high heat, breaking the meat into small pieces with a wooden spoon, until the sausage loses its raw color, about 5 minutes. Drain the sausage on a paper-towel-lined plate and set aside. 3. Mix ricotta cheese and ½ tsp. pepper together; set aside. In a separate bowl, toss the mozzarella and Parmesan together until combined; set aside. 4. Add the pasta to the boiling water and cook, stirring occasionally, until the pasta is just beginning to soften, about 5 minutes. Reserve 1½ cups of the pasta cooking water, then drain the pasta. 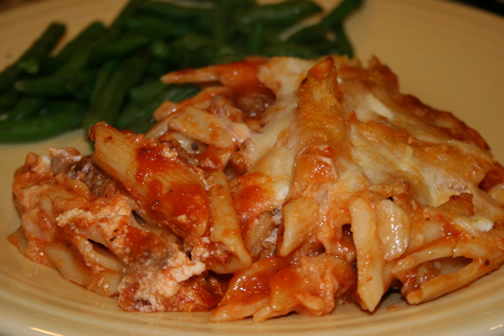 Return the drained pasta to the pot and stir in the marinara sauce, sausage, and reserved pasta cooking water. 5. 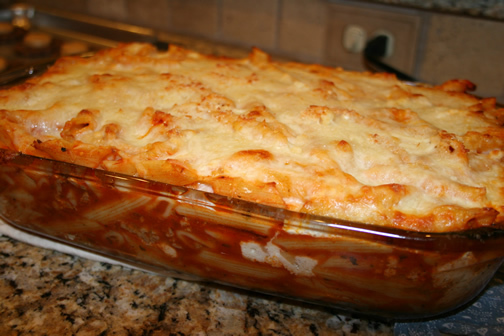 Pour half of the sauced pasta into a 13×9-inch baking dish. Drop large spoonfuls of the ricotta mixture evenly over the pasta, then pour the remaining sauced pasta over the ricotta layer. Sprinkle the top of the penne evenly with the mozzarella mixture. 6. Adjust oven rack to middle position and heat oven to 400°F. Cover dish tightly with aluminum foil that has been sprayed with vegetable oil spray (or use nonstick foil). Bake until the sauce bubbles lightly around the edges, 30 to 40 minutes. Remove the foil and continue to bake until pasta is completely heated through, 25 to 30 minutes longer. This sounds really good. I'll be giving it a try soon. Just wanted to stop by to wish you a Happy New Year and to invite you over for Crock Pot Wednesday. Hope to see you there. So glad I looked at your menu plan! I've never seen an easy recipe for Bourbon chicken, but love it when I'm cruising the food court. I'll have to try it! We're having baked penne, too. Must be that time of year for carbs and casseroles, LOL! Baked penne pasta in the oven right now. It smells wonderful! Thanks for all the recipes Cindy. The snow days have been a great opportunity for me to try several of your recipes. This looks really yummy Cindy. Might have to make it this week.